With a long and loud whistle on April 8th, 2 RMG cranes 1 RTG crane were loaded onto ship to sail to Thailand. The cranes are made for Lin Chapan port which is affiliated to Port of PAT(Port Authority of Thailand). The 2 RMG cranes are designed with the capacity of 70t and 60t; the length is 53m, and span is 27.5m. 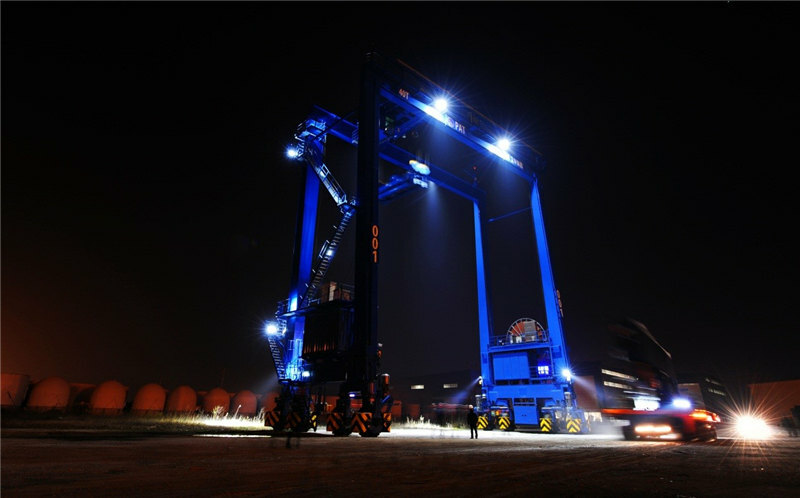 The lifting capacity of RTG crane is 40t, with span 23.47m. To meet the requirement of PAT, Weihua designers repeatedly demonstrated to carry out an appropriate plan, and finally started to manufacture after many times review. Considering the machinery would work in the port for many years and suffer big wind, high temperature and humid environment, closed-loop anti-sway system was equipped onto key parts of the RMG and RTG to stop swaying at any time when encounters strong wind or external force. Antirust design was adopted for these cranes, special paint was used and many structure corners were optimized to convenient for welding and improve the quality of paint. Anti-skid system was utilized to ensure the safety when it’s traveling and still; most of the parts of reducer, brake and motor were constituted by imported accessories to prolong their service life.